Rosa – she must crawl to get anywhere – When Will We Cry? From time to time some of you asked about the projects that we have going on and how you might help. Though we have many and there seems to always be a pressing need, I want to present two to you that are on my heart. 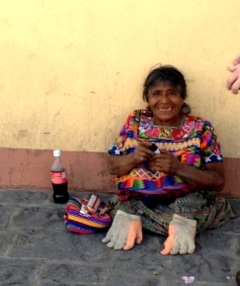 We first met Rosa, in Antigua, back in February, where she begs to survive. She touched our hearts as we blessed her with some money. Rosa was born with legs that never developed below the knee. She literally has to crawl every where she goes. To watch her struggle just to move along will break your heart. Rosa is a believer and a widow with only a daughter to care for her. We suspect they live in an old make shift shack on someone else’s property. This is a common practice for the extreme impoverished. We’re not sure where all of this will lead but we have committed to support her $100 monthly and hope that we can double this amount soon. 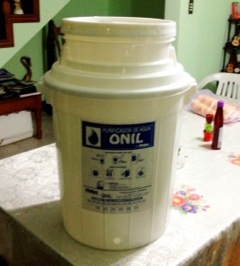 For $35 dollars we can purchase these portable water filters that have a carbon filter that will last up to a year. The cost for a second carbon filter is only $15. For around $50 we can provide clean drinking water for a family for two years! I would like to place 10 of these every month starting with our pastors. What a wonderful ministry tool if we can get these in the hands of pastors and church members – sharing Living Water with the lost as they provide them with clean drinking water. If you are interested in helping with either of these just send me an email and we’ll get started. Many thanks! God bless you.